Oh i get what your saying now. you mean the normal DLM modifications, this realistically won't be happening daily and the time of day is chosen for good reasons. Strange that my Skinny HG659 appears to have lost internet connection 2 days in a row at around 0530. System logs do not show enough info. Trying to set up a remote logging server to get lengthier records. I do see that my system has been up for 6 days, but that the VDSL up time shows about 45 minutes. For my line I am generally getting good and consistent speed (25/4.5). I have had the modem for 3 months now. Internal wiring is 3 metres to demarcation, no filter, no alarm and no other devices or extra wiring on the line. its not a cap. i believe its a physical limitation on the line card. I wonder what the actual limit is? i imagine and im only guessing here is its between 70 and 80mbps, they have used 70 as its a nice round number. I managed to get a small increase in performance from 17/1 to 19/1.2, however, the last few days have seen me rubber banding in online gaming (Rocket League in particular). I've tried restarting everything a couple times very early in the morning, but I can't seem to get any improvements. 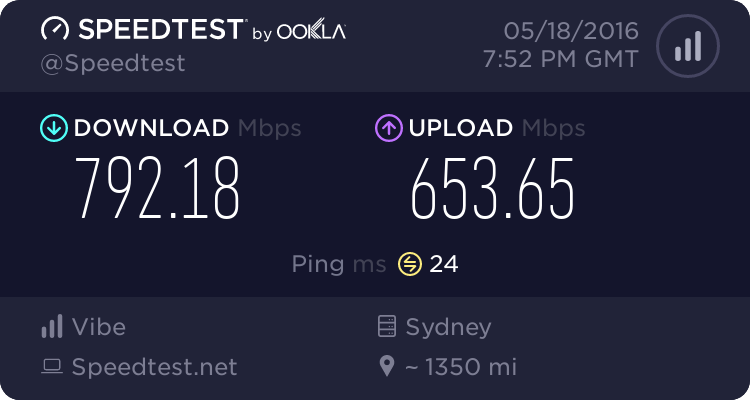 I haven't had an issue in the past (I've had VDSL for just under a year now) so I'm assuming that these changes are the reason for the latency? increase. My PC is plugged in via ethernet; my house has Cat6 cabling throughout. If Latency is funny you need to be measuring from the BRAS to your modem. E.g. First HOP. When you think latency is causing problems. Thanks @Linux and @darylblake for your responses! I do believe your issue is ddDLM related. ddDLM has the best intention and increase your sync speed as it thought your line can sustain a higher throughout. Unfortunately that causes a number of issues for you. I believe if you do a SpeedTest you will see high latency which will affect interactive apps and gaming. I have observed how ddDLM work on my line since it went live about 6 weeks ago. Some changes are defnitely good like signifciant increase in up stream bandwith. However, the default position of ddDLM pushing everything to a higher sync as a starting point may cause issues for some people (eg. people who game online). In my case, ddDLM pushes my down stream sync from about 50 Mbps to about 62 Mpbs. This causes significant CRC errors and the latest adjustment has seen the the Down Stream sync paired back to 48 MBps with significantly lower CRC rate and lower latency. Unfortunately, ddDLM is fully automated. You can't tell ddDLM that you are a gamer and your perfer lower latency to higher sync speed. The only thing you could do is to wait and see if ddDLM will do the right thing and pair back your sync rate to improve on CRC errors and latency. Often high sync rate with high latency/high error rate is actually not good from an overall performance's perspective. @smalltrader 1163 CRC errors over 39 hours is not much at all, that equates to .5 CRC errors per minute, that is nothing in terms of VDSL. its something like more than 10 per minute before you start to worry. you are correct about the FEC errors though, thats super high. You are right and I did not do the math correctly. I did the math over 24 hours but I guess even that the CRC is still within acceptable parameter. I think the problem with the original poster is that his line is already on the borderline and there is no margin to play with. Any increase in latency / CRC errors just push it over the cliff especially if you are gaming. ddDLM does not know that one a gamer or not. I guess it's just a waiting game to see if things get better I'll monitor for the next week or so and then post an update as an FYI to everyone; thanks for all your help! I'm not far from moving Modem close to road side pillar. Ordered the steel Box section to make up frame for solar panel, got some welding to do. Just need to finalise where the antenna goes, need to do some signal strength testing before I dig the hole.